More info:Bike hire: NZD$250 Single Supplement: NZD$750 Included: Transfers, accommodation & meals. Two Escape leaders, support vehicle Park fees Sevusevus Six days biking. Island transfer. Snorkeling. Coastal walk. Famous as a beach resort destination, Fiji is also a superb location for a cycling holiday. There are over 300 volcanic islands making up the island nation of Fiji and 110 of them are permanently inhabited. Their remote location in the South Pacific has both protected and isolated these islands, and a cycling holiday here is the chance to go beyond the upmarket resorts and meet the warm, friendly and relaxed people who live here, learning about the traditional values and the Fijian and Indo-Fijian culture that thrives here today. This Fiji cycling holiday takes in two of the main islands. Spend six days in Vanua Levu and then cycle through Taveuni, also known as the Garden Island. You will pedal past pretty villages, mountains cloaked with rainforest and along the coast, edge with palms and lapped by clear blue waters. Roads are quiet and winding, and you’ll have the chance to stay overnight in local villages, snorkel around reefs, freshen up beneath waterfalls and have a totally authentic tropical adventure. Our groups really are small! With a maximum of 12 in any one group we minimize our impact on the environments that we travel through. We travel by bike and on foot for a majority of the trip, making our way through protected national parks so it is important that we travel as lightly as possible (and keep carbon emissions as low as we can). Accommodation is environmentally sensitive - whilst in the mountains, we camp for a night in a hut with stunning views. Waste/rubbish management – when we travel we should treat our surrounding as we would treat our home (or better!). We do our best to avoid ‘single use packaging’ only using reusable or recyclable packaging. We recycle what can be, and manage any rubbish in the best possible way e.g. 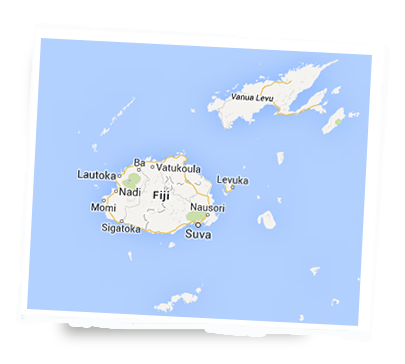 in Fiji – all of our organic waste is fed to local domestic animals or buried. It is important to us that when we travel to different parts of our amazing planet, our exchange is always a mutual one and that we make a positive contribution to people and places that we visit along the way. These days ‘responsible travel' and ‘sustainability' are hot topics. For us responsible travel is not about donating large sums of money to charity (at least not without thoroughly researching the long-term intentions or effects of the charity). We believe responsible travel is about taking time to think about how our actions can benefit or how they impact the people, communities, economies, environments and eco-systems we visit, and then use this to make a difference (or sometimes more appropriately - how we can NOT make a difference). We are constantly considering our actions and how we and the people who travel with us can improve our impact on the places we visit. During this trip we travel and cycle on three different Fijian islands and in the process employ the services of three small transport operators and drivers. We actively seek out and support small locally owned food and accommodation enterprises away from the busy tourist routes to help spread the wealth further than the big resorts and hotels. We buy locally grown and produced food as much as possible and we further support local businesses by staying in locally owned guesthouses, eating in local restaurants and taking our bikers to local operations and parks. We stay with two different local villages. As well as the fantastic social and cultural exchange experienced by visitors and locals alike, our visit also brings a regular income to the two communities (by paying for accommodation, meals and other services).